Google will announce a "brand new experience" for Google Earth on Apr. 18 —something which could simultaneously signal a much-needed upgrade of the Earth iOS app to 64-bit code. The company has so far been vague on details, except that the unveiling will involve a "new Google Earth" and an event at New York City's Whitney Museum of American Art, according to Engadget. Google has promoted virtual reality tours and augmented reality museum experiences in the past, and there might be some new layer in Earth. It could also be that the company will update the platform with support for Google Daydream, its Android-based VR technology, expanding on an app for the PC-based HTC Vive. The Google Earth iOS app has become neglected. Its last update was in May 2016, and then included only bugfixes and a modernized Google logo. Without a 64-bit upgrade, the app is likely to become obsolete by the end of the year. Apple has been phasing out support for 32-bit titles, preventing new ones from appearing at the App Store, and popping up iOS warnings that they can slow down 64-bit devices. 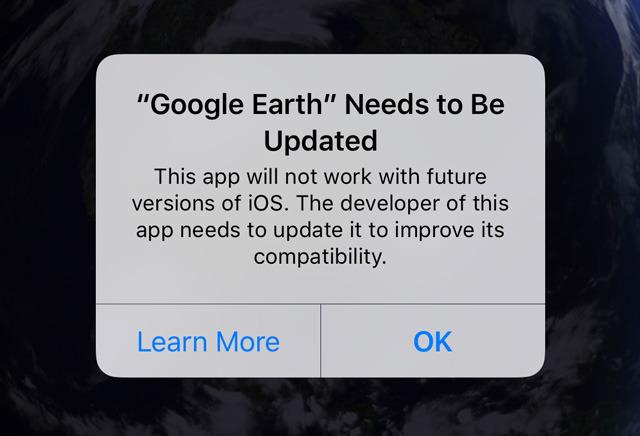 More recent messages say simply that 32-bit apps —including Earth —"will not work with future versions of iOS." While it was briefly thought that the cutoff could happen as soon as iOS 10.3.2, it's now anticipated that Apple will stop support with its next major release, presumably "iOS 11." That should be shown off at June's Worldwide Developers Conference, and be finished in time for new iPhones in the fall.